Colourful Street Art Is Taking Over Delhi Flyovers! Have You Spotted These Yet? Have You Seen The Colourful Street Art That's Taking Over Delhi's Flyovers? 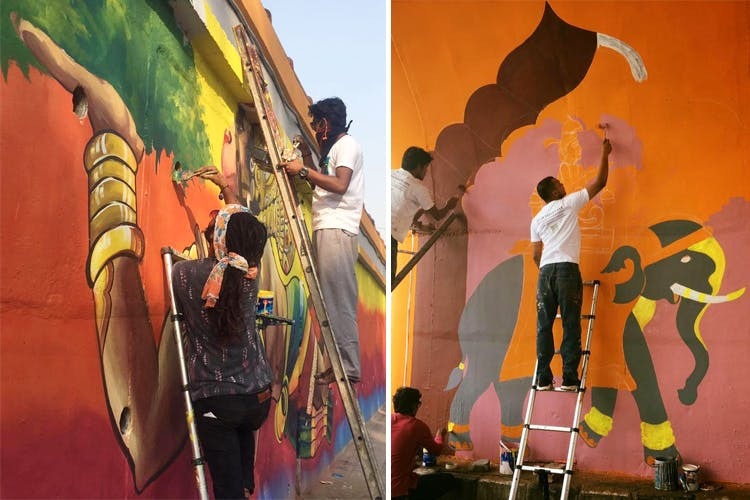 The MCD, in collaboration with Delhi Street Art, an initiative that promotes public art and young artists, has taken up a project to beautify the flyover walls near Kashmere Gate. The flyover across the old Hanuman Mandir at Yamuna Bazaar (which was once covered with paan stains and bits of torn, old posters) now looks bright and colourful – and it’s all thanks to the folks at Delhi Street Art. As part of the artistic restoration project, the walls and pillars in the area depict stories related to Lord Hanuman, graffiti of soldiers riding horses, of the Walled City and of local flora and fauna (amongst many others). To protect the structures and the artworks from pollution and moisture, a coating of anti-carbonation paint has also been given to these walls. Now, what’s not to love about pretty (& hopefully long-lasting) artworks and corners around the city?! Go check out these spaces ASAP.